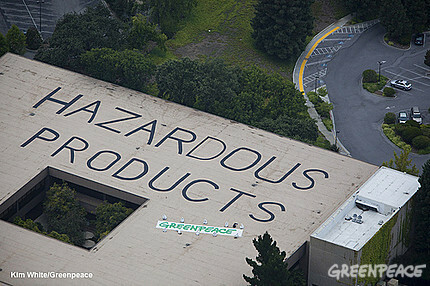 Greenpeace activists held a sit-in after painting "Hazardous Products" on the roof of Hewlett Packard headquarters in Palo Alto, Calif., July 28, 2009. Greenpeace exposed electronics giant HP for backtracking on its public commitment to eliminate key toxic chemicals in its products by the end of this year. The message, applied using non-toxic children's finger-paint, covered more than 11,500 square feet, or the size of two and half basketball courts. On Monday, nine citizens in Des Moines, Iowa were arrested at a protest for the creation of single-payer healthcare, the establishment of healthcare as a human right, and an end to the deadly practices of Iowa’s largest health insurance company, Wellmark Blue Cross Blue Shield. Thousands of municipal workers went on strike Monday across South Africa to demand higher wages, and 27 were reportedly arrested as police broke up protests. Registered nurses and hospital workers at facilities owned by Tenet Healthcare Corp., represented by the California Nurses Association/National Nurses Organizing Committee (CNA/NNOC) and SEIU, organized a national protest to oppose attempts to cut their access to sick leave. More than 70 percent of the members of the Prison Officers Association, the union that represents prison staff in Ireland, have voted to strike as a dispute with management over their working terms and conditions intensifies. On Monday morning, one hundred Palestinian children marched from the village of At-Tuwani to a village called Tuba along a path where illegal Israeli settlers have attacked Palestinian children and shepherds, as well as international human rights advocates. After an 8-year-old boy was shot Saturday in a blighted northeast Las Vegas neighborhood, residents held a rally to protest violence against children.